After about a year and a half I finally got my 1946 CJ-2a back together and running. Now I'm trying to get everything fine tuned, and here lies my question. I was unable to set the timing with my timing light since the timing marks failed to appear no matter how I set the advance on the light. However, I got pretty close by adjusting the distributor by ear. The carb required a little tweaking of the mixture to get it running smoothly, though it wants to idle between 850 and 900 rpm. So here are the questions. Since I can't use the timing marks on the flywheel, is it feasible to put timing marks on the belt pulley? If so where would you position the pistons to make the marks? 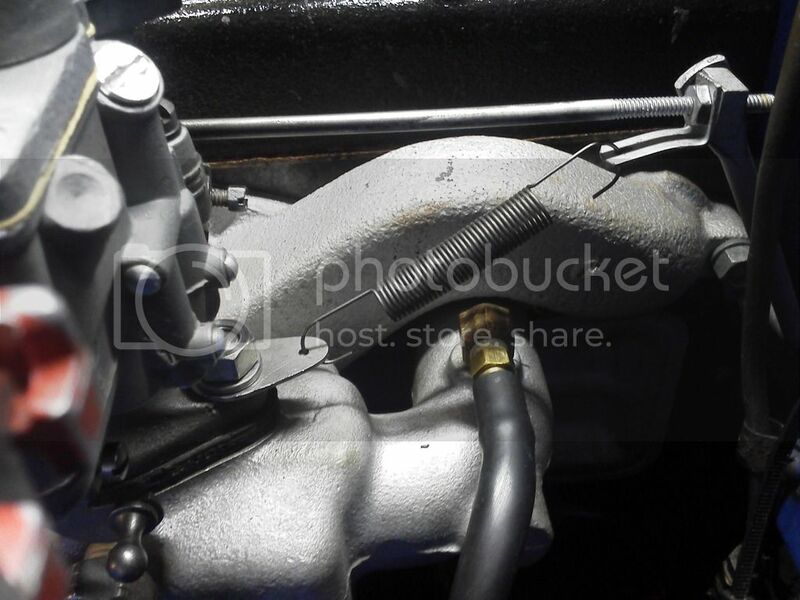 What is the proper method to adjust the carb other than by sound and idle? Is my idle within range? Is there a specialty instrument to help with the carb adjustment? Here is something you may find more helpful. How to time your motor without a timing light. If you still have the high idle situation, let me know. Thanks for the info. I'll search out a vacuum gauge and go through the steps recommended in the link. I’m anxious to hear how it turns out. I found an old vacuum pump with a gauge. Where is the best place to hook it up? I’m sorry. You do not want a vacuum pump with a gauge. Go HERE and look at the vacuum gauge. You will also need the dwell tachometer sitting next to it in the photo. Hooking it up is easy if you have a vacuum wiper set up. 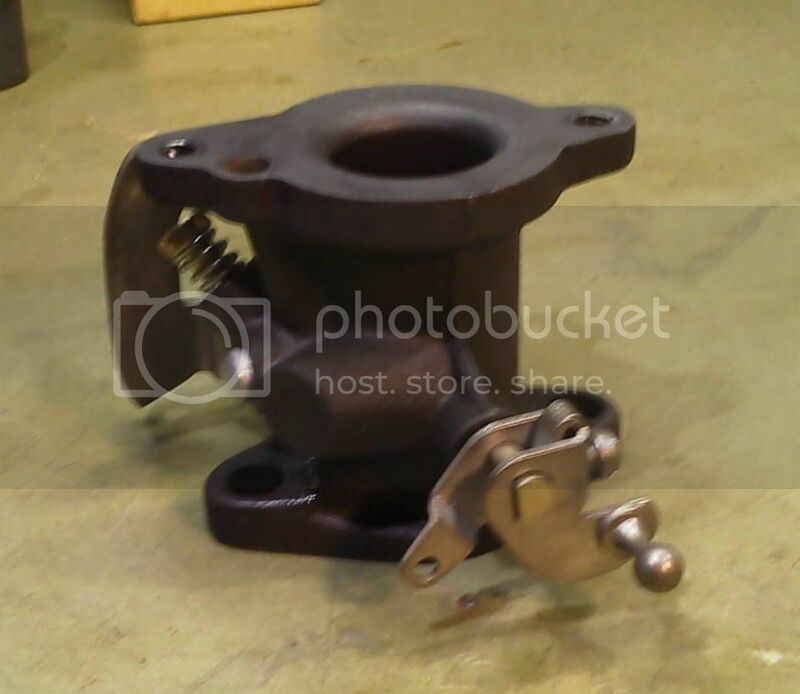 Look at the photo and under the throttle return spring you will see the fitting in the intake manifold. I hope this helps. I have the vacuum assist windshield wiper motor set-up in the location specified, as well as a tach/dwell light. Before I shell out money on a vacuum gauge, would a carb down-draft gauge be suitable? I have two which I use to balance the carbs on my Pinz. No sir. You want to measure intake manifold vacuum, not carb vacuum. Keep in mind that a good vacuum gauge will tell much information about the health of the motor and will point you in the direction of a problem before it gets out of hand. A quick check just showed me a $16.00 unit on Amazon. HF has one as well. Vacuum gauge procured and everything else in place. Here are the results of the carb/timing adjustment. Mixture screw turned out two turns and idle screw turned in three turns prior to start of adjustment. Plugs clean and gapped, and valves adjusted. Oil and coolant okay. Ambient temperature approximately 44 degrees F. Got the motor up to operating temp and adjusted distributor instructed. Vacuum after dropping RPM stayed at 15"-16" Hg. Adjusted idle screw to maintain vacuum at 15" Hg, which resulted in an idle of around 1100 RPM. Any slower and the vacuum dropped and became erratic. Screw in the mixture screw in 1/8 turn increments. When the mixture screw got to 1 1/2 turns from bottom the engine RPM dropped and died. It would restart with a pump of the gas, but died again until I returned the mixture screw to two turns out. The best I could achieve is 1 7/8 turns out. At this point it would idle smoothly at 1000 RPM and maintain a steady 15" Hg vacuum. I repeated the procedure about three times with the same result: smooth 1000 RPM idle, steady 15" Hg vacuum, good throttle response, stopped without knocking or run-on, and easily re-started. I was unclear on one point: when reducing the idle at the distributor, do you turn the distributor clockwise or counterclockwise? What advice do you have to get the idle to a respectable 700 RPM? On a side note, I discovered that my flywheel is 180 degrees out of alignment. I set the timing light to two stroke and advanced the light to 95 degrees, and there was the timing mark. If this is a freshly rebuilt motor, I’m inclined to think that the timing is too far retarded. Turning the distributor clockwise advances the timing and raises the vacuum reading. 15” is at the bottom of the acceptable range. If re-adjustment of the timing does not bring it in then scenario #2 comes into play. If this is an old used motor, I’m inclined to go with worn, cracked or broken rings. The motor is original as far as I know. I'll try a cylinder leak down test and see what happens. Compression tests, wet and dry and a leak down test. I conducted each test twice for each cylinder, and the results were +/-3%. I tried the leak down test but on each cylinder the motor kept trying to spin, despite removing all of the spark plugs. The best I could do was to brace the breaker bar and move it slightly clockwise to keep the valves closed. In this way I could get a reasonable leak reading, which roughly ran 5% to 10%, and I could detect a little air escaping from the carb or oil filler hole depending on how well I was able to keep the breaker bar immobilized, which was a struggle. I've done this test on other motors but didn't have this happen. I discovered that the #3 plug was a little loose and had some carbon on it. After I reassembled everything I covered the instructions once more, and was only able to get the idle to remain steady at 950 RPM. I removed the air cleaner elbow from the carb and shot the strobe down it, and saw a lot of liquid fuel droplets in the bore as the motor ran. I leaned out the carb while watching the stream but was not able to get it to change from drops to mist before the motor died. How much air pressure did you use for the leak down test? If minimal, then it sure looks like rings are the culprits. One hundred pounds was the least I could use with the tester.